Mahalo George for teaching us this morning about all the various underwater critters. What a fascinating world this is! If you are an ocean swimmer like me, I guarantee you will be fascinated by the cover story in the most recent Hawaiian Airlines magazine, Hana Hou. It is about free diving to great depths and holding your breath for four, five, six and more minutes without causing brain damage. Amazing stuff! 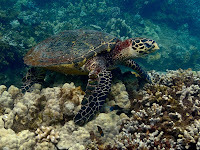 My buddy, the Hawksbill Turtle, is back in its usual feeding grounds. I haven't seen it for a couple of months and have been concerned because it is a Critically Endangered species. 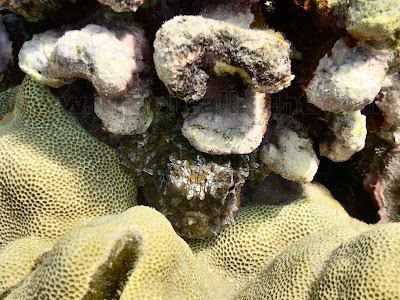 It was happily munching away on algae and sea sponges, and didn't even look up to say "Hello" to me. The current called the Tahiti Express was ripping at nearly full-speed this morning. I swam in one direction for 50 minutes with the return taking only 10 minutes. 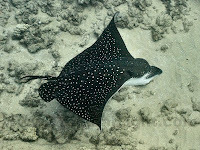 I almost gave up early on, but was inspired by how easy this Spotted Eagle Ray made swimming up-current look. Poor critter seems to have lost its tail (I'll have to look for it the next time out). After the wedding and all of the photos have been taken, the current Hot thing in wedding photography is to TRASH the DRESS. After all, will it really ever be worn again? Not likely. So why not have some wild fun in it? This celebrity couple was reluctantly playing in the waves in front of the Four Seasons Maui this morning as I passed by. When I climbed into the ocean for my morning swim, the dolphins were there waiting for me. "Where have you been, Don?" they asked. 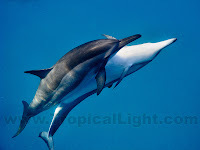 How does one explain the concept of architectural photography to spinner dolphins? How wonderfully exotic! I got to do a photo shoot today (technically yesterday, since it's after midnight) at one of the most famous spots on earth. Waikiki Beach with a great view of Diamond Head. I get to have all the fun. I recently watched a special on tv about the Cuttlefish (something between a squid and octopus) and their ability to change their skin to match their surroundings. Well, I would say that our octopus is right up there with them, including being able to change both color and texture of their skin. George pointed out this little one to me today. Click HERE for photos from today's swim. 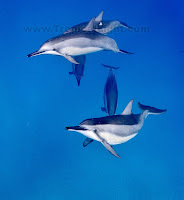 I went for a swim this morning, and a smaller group of about 24 spinner dolphins joined me again. I could tell they had been a part of the much larger group which I swam with on Thursday because I recognized one of the babies. A good time was had by all and I look forward to our next swim together. What fun! 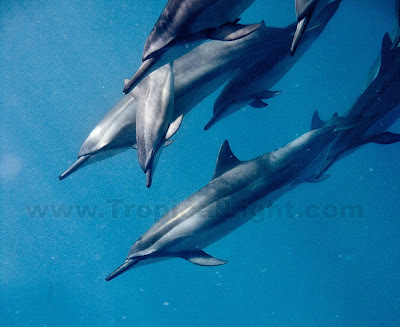 Scads of Spinner Dolphins joined me for my swim this morning. Several of them must have been really bored because they insisted on swimming with slow old me. I had a great time! Click HERE (or Below) for a short video of today's swim. I never had any kind of pet growing up, so I have no interest in dogs or cats. Until today, that is. There were two little dogs which went trotting past our house this afternoon. 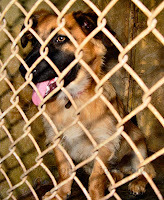 Later, they wandered uninvited into one of the homes which Doug manages, and settled in to stay. While the family liked these adorable friendly dogs, they were not ready to adopt. 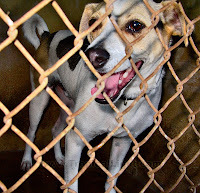 The dogs both had collars, but no ID tags; so I took them to the humane society. The little terrier quietly rested its chin on my shoulder during the drive, almost breaking my heart. Although they had been absolutely silent until then, they began whining when I turned to leave after locking them in. "Please don't leave us to be put to death," they pleaded. Fortunately, Doug, who knows everything, was able to find their owner who was very happy to know they had been found. Hopefully, he will also know how to remove dog vomit (thanks to the puppy) from my back car seat. I love walking along the beach. I get to see all kinds of interesting people doing unusual things. This woman was practicing her body builder poses. I swam at La Perouse bay this morning with Marna and Laura Anne. L.A. loves long swims and deep water but Marna, who is new to ocean swimming, was uncomfortable to say the least. I must commend her on her bravery, swimming out with us to where only the BIG fishes swim. I got to work on the roof of one of the highest buildings in Kihei this morning. I used to have a fear of heights, but had no problem leaning over the edge to get photos of the pool directly below. I have experienced vertigo in the past where I could swear that I was sliding toward the precipice. Thank goodness those thoughts never entered my mind, because today's edge had no lip or barrier of any kind to stop a slide. Our fun little Sunday swim group is no more. So many people have been showing up that a tipping point has been reached where the group behaves differently. I am fascinated watching a "mob mentality" develop. When it was a small group, we would regroup from time to time and keep tabs on each other. The group would reach a consensus, then act as a cohesive unit. With the larger size, the group behaves spontaneously, surging from place to place. It is no longer a group, but instead many individuals following first one person, then another. Anyone who wanders away from the "school" is now left on their own. I had to laugh at this sign which I saw for the first time this morning. The former path had been ripped out and replaced with truckloads of sand. The new sand must have come from elsewhere which made the whole "Natural Dune" quite humorous. We watched Tropic Thunder this evening and it was hilarious. We laughed and laughed. Then we laughed all the way home. I am still chuckling thinking of certain moments. I can't think of the last time I laughed so much or for so long. CAVEAT - this is a great "guy" movie. Everything blows up. Also, much of the humor was based on obscene language, political incorrectness, and on blood and gore. It was also surprisingly sophisticated. Now, I am not a fan of gross-out humor. But this was so very well executed that I enjoyed every minute. And it was done with great restraint. The dialog was witty and made fun of other movies, actors, and Hollywood in general. And, of course, Robert Downey Jr. was Brilliant playing a blonde Australian playing an African-American soldier. Did I say Brilliant? Good. In Hawaii we call it Plumeria. The genus was originally named Plumiera in honor of the 17th century botanist, Plumier. 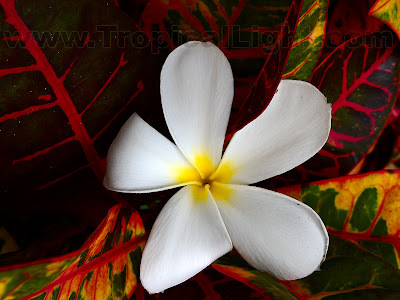 It is known by different names in different countries, but most commonly as Frangipani after the Italian family which made a perfume with its scent in the 16th century. It is related to Oleander and its sap is equally poisonous. Other common names are: "Kembang Kamboja" in Indonesia, "Temple Tree" or "Champa" in India, "Kalachuchi" in the Philippines, "Araliya" or "Pansal Mal" in Sri Lanka, "Champa" in Laos, "Lantom" or "Leelaawadee" in Thai. And, of course, "Cacalloxochitl" in Mexico. 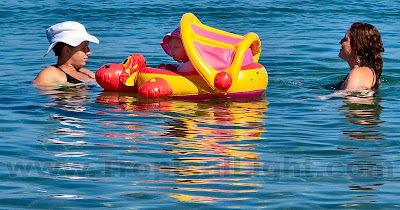 As I pulled into the beach parking area this morning, I saw a dolphin jump clear of the water and land with a big splash. I saw L.A. standing by her car and asked why she wasn't in the water swimming with the dolphins. She hadn't seen them, but was now so excited that she couldn't find her shoes. She unlocked the trunk, no shoes. She closed the trunk and unlocked the driver's door, no shoes. She unlocked the trunk again, no shoes. Before she could close the trunk I pointed out her shoes hiding in plain sight. Quickly she put the shoes on and hurried to the water's edge. 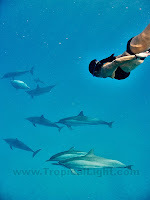 When the dolphins surrounded her, she was giggling and laughing and giggling some more. She was thrilled! At first we swam with about twenty dolphins. 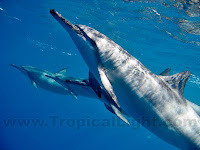 Another group must have joined the first because we were soon swimming with about a hundred spinner dolphins. They were active and full of clicks and chirps, they did a lot of jumping and spinning, and even interacted with us to an extent. What fun! (Click HERE or Below for today's very brief Video). I whined over and over about how I wished we had an evening promenade through town like they do in most southern European towns and cities. Well, I stand corrected. 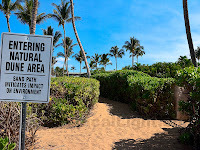 Each morning on Maui many people walk for exercise along the beaches. Some even stop and talk to those they meet. Maybe the focus is on working out, and maybe it is only a tiny fraction of the population, but it does happen. So it is time for me to stop whining (at least about this). A couple of months ago I noticed some guys climbing around on the rocks in front of our house. They were searching inch by inch just below the waterline, and putting what they found in a big plastic bucket. 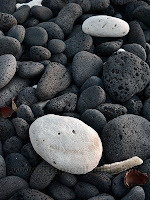 This morning I saw them again on Keawakapu beach searching one of the lava promitories. But this time the bucket was on the shore so I could peek in. Way cool. 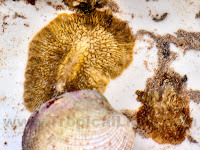 They had several small starfish, lots of pretty shells occupied by hermit crabs, and some amazing sea slugs (which I had seen called nudibranches at a photo exhibit). All of the critters were active: the starfish were crawling, the slugs were swimming with a wavelike motion and the crabs were dragging their shells around behind them. 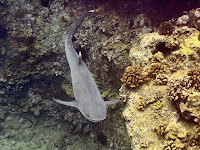 I never inspect the coral closely and carefully enough to see these amazing creatures; I am too busy swimming on by. I did not have my underwater camera with me and the only shot today which was in focus was of this not very colorful sea slug. The others were a bright red color. I'm sure these animals (the ones that survive) will be sold for use in aquariums. Interesting way to make a living. 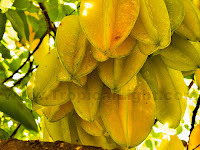 Our Star Fruit tree is heavily laden with ripening fruit; some branches have bent to the ground under the golden weight. I picked a few, then went on the internet to find out what to do with an excess. Bread or smoothies, or maybe something more exotic? Oops. That's when I became aware of Star Fruit Intoxication! Star Fruit has the highest concentration of Oxalic Acid of any food. It is also considered to be a potent inhibitor of seven cytochrome P450 isoforms, similar to grapefruit, which causes severe interactions with many drugs including statins for the control of cholesterol. Lipitor and Star Fruit can cause death. According to a Brazilian study it also seems to contain a potent neurotoxin. It seems that a single Star Fruit is enough to kill someone with severe renal difficulties. If that's not enough, Oxalic Acid causes minerals, especially calcium, to precipitate out of solution into insoluble crystals. It is one of the biggest causes of kidney stones. 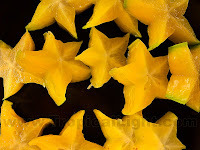 Anybody want some Star Fruit? 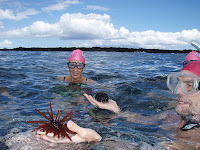 You mean there's something to do on a Sunday morning other than swim with the Maui Pink Cap Swimmers? I've been beached by a cut (silly doctor is worried about the possibility of infection) so I took a stroll this morning with the lovely Anne Marie. Church bells and voices raised in song were drifting on the light morning breeze. We passed tennis players thwopping the ball back and forth, and a group of kayakers paddling in the sand. We watched volunteers wading ashore after a weekend on Kahoolawe, their belongings floating beside them tied in black plastic trash bags. Then hands locked in a big prayer circle for a blessing. We are fortunate to live in a small house clustered with a few neighboring homes on a rocky promontory jutting into the tropical Pacific ocean. This old, but not ancient, lava flow supports a colorful garden of coral, fish and turtles just below the water's surface. A man might lose his job and home and be forgiven by his wife. He might mistakenly respond that, yes, those pants make your hips look fat and be forgiven. But he will always remember (and rue) the day he forgot their wedding anniversary. In an attempt to guide their future husbands' away from committing the unforgivable sin, wedding parties were lined up five deep at many Maui beaches today. Today, the eighth of August, 08/08/08. To the wives, please be gracious when you receive flowers and chocolates next year on the seventh of July - they are only men after all. How strange to be out in the middle of the ocean and to hear your name being called out. Today was the second time it has happened in a week. But it was good to see my buddy L.A. back on island again. Uber super-athlete, James, joined her for a swim today. Wow, what a mono-fin! He was really moving fast with that thing on his feet; but I suspect that it wasn't just the fin that made him fast. Bruce's buddy (why haven't we named it yet?) was briefly out and about today. Unlike Bruce who is shy and retiring (and who was hiding at home today) this character is bold and occasionally threatening. Keeps life interesting. What the heck is my fascination with trees? 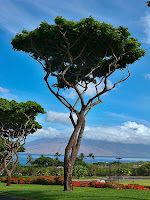 I think I have more photos of trees on my blog than photos of turtles or dolphins. Or even of Patti! Oops! I got wrapped up in a photo shoot yesterday and never quite got around to posting a blog entry. My bad. Janet and Patti came all the way over from Haiku this morning for a dip. They said they were out of shape and were up for an easy swim. Yeah, right! They worked me good. I did enjoy myself, when I wasn't panting out of breath trying to catch up to them, that is. 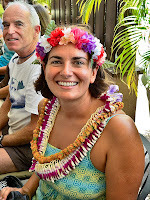 They filled us in about their upcoming relocation to Thailand and India. I hope they set up a blog this time; their travels (and travails) are always fascinating. Wow, a lot of people showed up for the Sunday swim this morning. Most of them took off like jet skis skimming the surface, but a few of us slowly explored as we went. 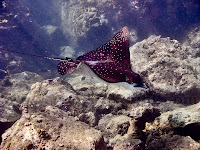 And lucky us, we got to swim with four highly interactive Spotted Eagle Rays which everyone else missed (click HERE or Below for today's video). I did get to see everyone as they passed me going the other way, already finished with their swims. I love swimming this time of year because the water is warm and I don't have to keep swimming to keep from freezing to death. I recently read somewhere that one of the most creative acts a person can perform is to read. "Wait a minute" I thought. "How can passively sitting in a chair reading a book possibly be creative?" This throw-away comment got me thinking. I could understand how the author is a creative force, but the reader? Then it became clear to me. When I settle in with a book, all that exists in front of me is a white page covered with little black markings. From these markings my mind creates entire worlds filled with sights, sounds and smells and populated with interesting characters. Yes, the author guides my mind, but it is my mind which does the work. 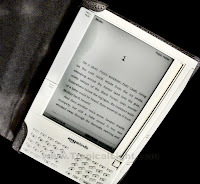 What I really wanted to write today was my progress report on the amazon.com Kindle book reader. When I received it as a birthday gift I thought it would be a fun toy, but definitely extravagant and somewhat silly. Well, it has been GREAT. I was able to travel for a month with 60 novels in one paperback sized book. When I got to the end of one book I was reading and it said - the story continues in the sequel - I was immediately able to get the sequel and continue the adventure. Being on a ship in Russia at the time, there was no other way I could have gotten that sequel. Nyet! My biggest rave is about the convenience. I used to read and read and read. Then I got busy with life and work and suddenly it was too difficult to drive to the library or order a book online; besides, there just wasn't enough time to be able to read. Now, when I hear of an interesting book I get the first chapter sent to my Kindle for free. I spent my entire day off today reading, and it was a great day. My recommendation has been upgraded from Wait-and-See to Buy. By the way, if you get one, buy a LED book light for night reading. Forget the kayak or new car - I want one of these!